This shows the city population and current population capacity. A city can grow to have more population than capacity but this will create overcrowding and has a negative effect on public order and growth. The city level controls the radius of your city and the maximum level for land improvements around your city. This is the rate your city is growing at per season. Negative rates mean your city is shrinking! This is the number of coins your city is generating per season. Corruption: If the city is making excess profit some money might start going missing! This shows the public order levels in your city. Your city will begin rioting and you will be unable to build new buildings if your public order falls too low. The walls for defending your city. Stronger walls give defensive units more protection. Walls slowly repair their health up to their maximum. You can increase the maximum by upgrading the walls building. These are the resources in your city. See the resources section for more information. This shows the owner and the map location of the city. These tabs provide additional information about the city and allow the upgrading of buildings, training of units and improvements of the city lands. Closes the city window and returns you to the map. This is the Build Your Empire tutorial. Here you will find tips for getting started and details on how different aspects of the game work. Use the menu on the right to explore the different sections of this page. Build Your Empire is an online game which you play in your browser against thousands of other players. The aim is to build cities and armies on the game map. You have to balance defence and offence while maintaining your cities to be a successful player. Game play is in realtime and all things slowly tick up as you are playing. The base unit of time is a "season" and the length of a season varies depending on which server you are playing in. On the game map you can use your mouse to click on cities and army to get more information about them. Your cities are the corner stone of your empire. They generate income and they are used to train units. If you lose all your cities, you are defeated. When you click on one of your cities on the map a window like the one shown below will appear. Use your mouse to hover over the different sections of the image below for an explaination of what they mean. Buildings are constructed inside your city and they are used to improve your city. Different buildings have different functions. To construct a building you need to first click on a city on the map. This will open your city window. On the city window, click on tab labelled "buildings" towards the bottom. This will show a list of the buildings in the city. The list shows all the buildings in the city and their current level. Buildings with a higher level are more effective. Each building also has upkeep which is the cost per season to maintain that building. To upgrade the building, click on its name and it will be added to the construction queue. Units can move around the map and are used to defend and attack cities. 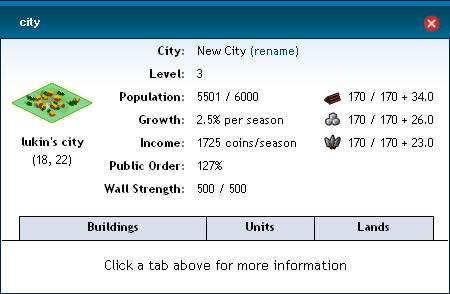 Units can be trained in your cities by clicking on the "units" tab and selecting a unit from the available units under "Train Units"
Upgrading buildings in your city will open new options for units to train and there can only be a maximum of ten units on a single tile. It is important to always leave some units in your cities or you risk the city rioting and turning into a rebel city. There are three resources in the game: wood, stone and iron. These resources are required for training units, upgrading buildings and maintaining buildings. Unlike coins, resources are contained within a city and are not shared between cities. The resource income is determined by the surrounding terrain in the city's color radius. You can improve this income by upgrading the terrain around the city. To do this, select the city and press the "lands" tab. This will open up a map of the area surrounding the city. Click on the tile which you wish to improve and a list of options will show beneath the map. Selecting an option will start it upgrading. Each of the terrains can be upgraded to the same level as the city and each upgrade improves the income for the tile. Farms improve the farming income of terrain which improves the city coin income and population growth. Villages increase the population capacity of the city. Lumber camps improve the wood income, Quarries improve the stone income and Mines increase the iron income. To capture cities and found new cities you need to be able to move your armies. You can move all or part of your army around the map in small steps. The size of the steps is determined by the unit's movepoints which slowly recover when the unit is stationary. To move your army the first step is to click on your unit on the map. If your unit is in a city, click on the city and then click on the "units" tab. This will show the units which are currently on this tile. Click on the little pair of footprints underneath the units to begin moving them. A yellow move radius will now be shown around your units. This shows you how far you can currently move your units. By clicking anywhere within this move radius your army will move to that tile. If you don't want to move the army, click on the army again and it will deselect it. But what if you only want to move some of the units which are on that tile? To only move some of the units, first click on the army so that you can see the panel displaying the units that are on that tile. If you click on one of the pictures of the units the unit will fade. That unit is no longer selected and will not be moved when you move the rest of the army. This is a good way to split up your army or leave units behind to defend a city. Expanding your empire is very important! Having more cities means you will have faster growth, more income and stronger armies. The first step for establishing a new city is to train some settlers. You can train settlers from any level 3 city. When training a settler you need to choose the amount of population you want it to have. This population will be the population of your new city when it is founded. The more population a new city has the faster you will be able to grow it! However, using more population takes longer and costs more to train. It also takes population away from your current city. By clicking on the little city icon beneath your units your selected settlers will found a city on that tile. You can build a city using multiple settlers by having them all selected or you can click on the settlers to deselect them. Only the selected settlers will be used in founding the city. The population of the new city will be the combined population of all the settlers used to found the city. Mastering combat is important for growing and defending your empire. Your units can be used to attack enemies and to capture their cities. To attack an enemy you must first move your army onto a tile directly next to an enemy army or city. Once you are there, use the option to move the units again and this time you can move them onto the enemy with the option "attack!" When you select to attack the enemy a little sword will show on the map indicating that your units are now attacking. The battle is won when one side has all their units reduced to 0 health. Capturing an enemies city is a great way to grow your empire quickly. But you have to be ready to fight for it! The first obstacle to capturing a city is breaking through its walls. Only siege units can do damage to a city's walls, which means until you are able to build siege units you wont be able to capture any cities with walls and it also means your walled cities are safe unless attacked by siege units. Once your siege units have reduced the wall health of the defending city to 0 then your units will attack the defending units in the city. Finally, when the defending units have been defeated the city will be claimed as your own!